As the weather is still fairly extreme with heavy rains; winds and frosts, most perennials with the exception of the Hellebores are looking fairly sad in February. 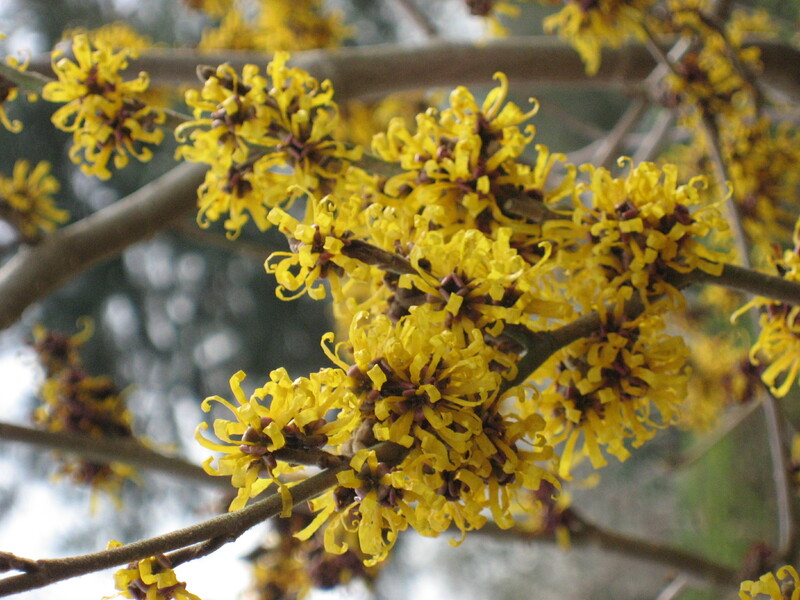 At this time of year the winter flowering shrubs and trees come into their own and therefore my choice of plant of the month has to be Hamamelis, the Witch Hazel. Flowering straight from the branch, these offer a host of spidery yellow, orange or red flowers with a range of heavenly scents. The yellow varieties such as ‘Pallida‘ and ‘Arnold Promise’ are two of the best. The darker colours have less scent in comparison. A commonly available copper coloured variety is ‘Jelena‘ which is unscented. The most common red flowered variety is ‘Diane‘ which is slightly scented. All of these can grow up to 2 – 4m high , so should be planted as a shrub or small tree. Hamamelis dislike shallow, chalky soils and will not do well in wet or waterlogged conditions.